These Working Group Candidate Recommendations supplant and supersede the earlier Community Draft Specification (February 2013) produced by the Community Group and available from this server. This Web site is maintained now for historical purposes only and to provide continuity for early adopters and implementers. February 2013 Community Draft Open Annotation Model. The earlier Open Annotation Specification (Community Draft 2) is still maintained on this Web site, but this specificiation should be considered deprecated and superseded by the W3C Candidate Recommendations mentioned above. 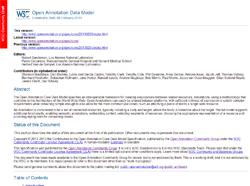 The W3C Open Annotation Community Group was jointly founded by the Annotation Ontology initiative and the Open Annotation Collaboration. In 2013, with the support of the Open Annotation Collaboration and the Andrew W. Mellon Foundation, the W3C OA Community Group hosted three public rollouts of this specification: U.S. West Coast, U.S. East Coast, and in the U.K. 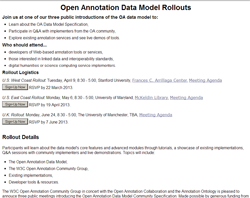 These rollouts concluded the work of the Open Annotation Collaboration. These events were made possible by funding from the Andrew W. Mellon Foundation.